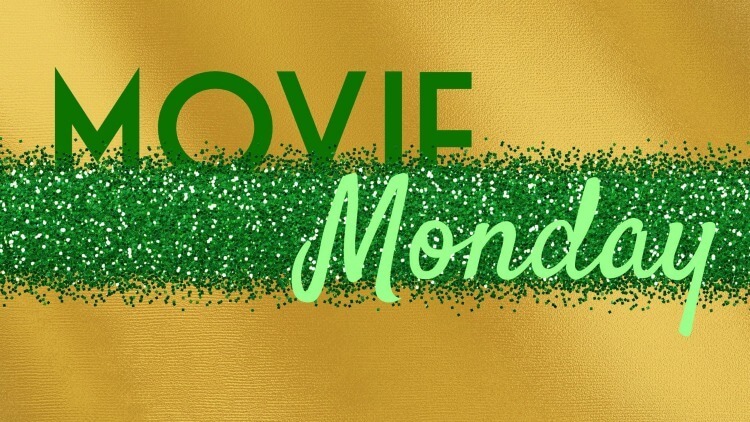 It’s the Movie Monday Challenge! 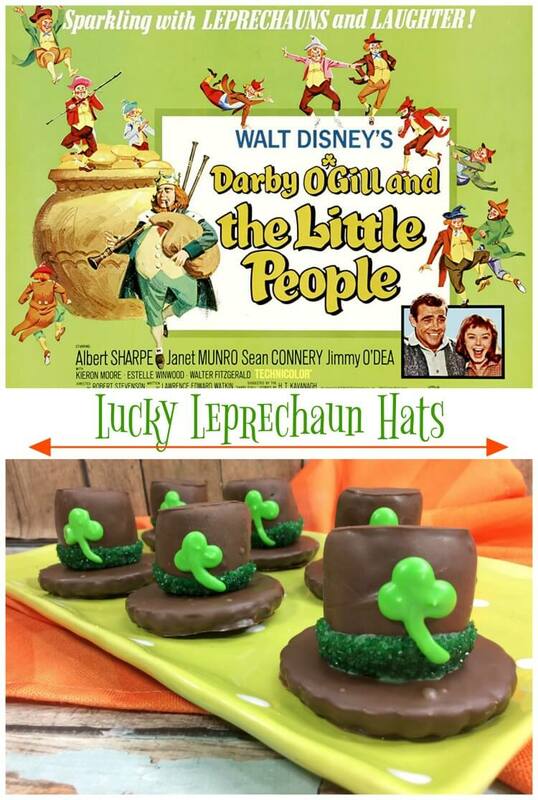 Our inspiration was LUCK just in time for St. Patrick’s Day! My movie was Darby O’Gill and the Little People. It’s a fun Disney movie for the whole family, and it’s got a young Sean Connery! It’s the story of an Irish caretaker who gets three wishes from the king of the leprechauns. I remember watching it as a kid. We’ll be having movie night soon for my kids with this one. 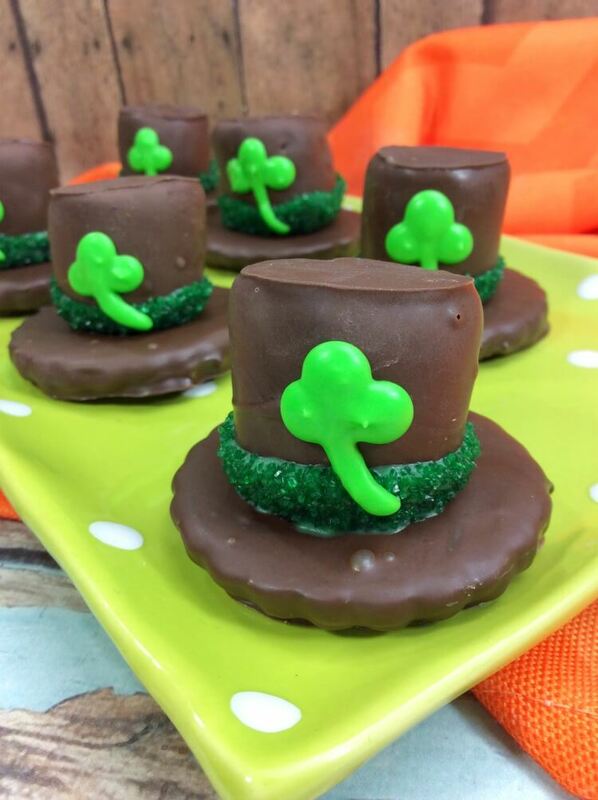 To go along with our leprechaun theme, I’ve got some Lucky Leprechaun Hats made with marshmallows and fudge stripe cookies! 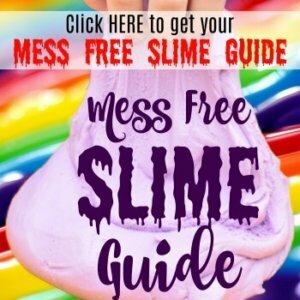 This might look hard, but honestly, they are totally easy. If I can do it, then you can, too! 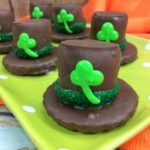 This recipe will make a batch of about 12-16 lucky leprechaun hats. First melt the chocolate wafers in a microwave-safe bowl for 30 seconds at a time, stirring after each time until the chocolate is completely melted and smooth. Next, dip each fudge stripe cookie individually. Make sure to use a fork to flip over the cookie so it’s completely coated. Let the excess chocolate fall off (tap the side of the pan to help it along) and then lay each cookie down on a parchment paper lined cookie sheet to harden. While the cookies are hardening, let’s move to the marshmallows. To make dipping the marshmallows easy, insert a toothpick in the center of a marshmallow. 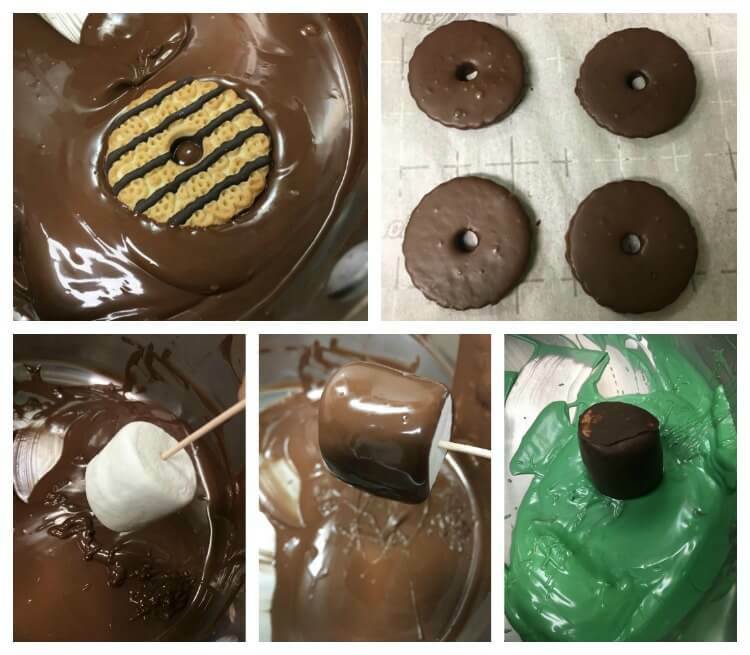 Then, dip it almost completely into the chocolate, leave a little marshmallow on top exposed like the picture. Then, set each one on the parchment paper to harden. DON”T REMOVE THE TOOTHPICKS. Pop the cookie sheet into the freezer for about 10 minutes to make sure everything is hardened. While the marshmallows are hardening, now it’s time to melt the green candy melts in the same microwave method (every 30 seconds and stir, until smooth). When the candy melts are partially melted, mix in the coconut oil to thin out the candy melts and make it smooth. Now it’s time to make the green hat bands. Pour the green sanding sugar into a small bowl. When the marshmallows have completely harden, carefully remove the toothpick. Then, dip the bottom of the exposed marshmallow, just about 1/4 inch into the green candy melts and gently shake off the excess. Then, quickly dip into the sandy sugar and then place on top of the middle of the dipped cookie. Work fast so that the candy melt will glue itself to each cookie. Do this until you’ve create a “hat” with each cookie. Carefully, pop the cookie sheet back into the freezer for 10-15 minutes until completely hardened. Once they are totally hard, remove from freezer and carefully lean the cookie hats along the side of the cookie sheet. Re-microwave the candy melts in the same 30-second increments until they are smooth again, then transfer them into a piping bag and cut the tip off. Now, you will pipe on 3 dots onto the middle of a hat. Then, using a toothpick, drag the dots together so that you can connect them and make a shamrock. Then pipe a line from the bottom of the dots to create the stem. Let the shamrocks harden for 30 minutes to an hour before enjoying and packaging up. Melt the chocolate wafers in a microwave-safe bowl for 30 seconds at a time, stirring after each time until the chocolate is completely melted and smooth. Dip each fudge stripe cookie individually. Make sure to use a fork to flip over the cookie so it’s completely coated. Tap the side of the pan to help it along) and then lay each cookie down on a parchment paper lined cookie sheet to harden. While the cookies are hardening, insert a toothpick in the center of a marshmallow. Holding the toothpick, dip it almost completely into the chocolate, leave a little marshmallow on top exposed. Set each one on the parchment paper to harden. DON”T REMOVE THE TOOTHPICKS. Pop the cookie sheet into the freezer for 10 minutes to make sure everything is hardened. Melt the green candy melts for 30 seconds at a time and stir, continuing until completely melted. Add the coconut oil to thin out the candy melts and make it smooth. Pour the green sanding sugar into a small bowl. When the marshmallows have completely harden, carefully remove the toothpick. Dip the bottom of the exposed marshmallow, just about 1/4 inch into the green candy melts and gently shake off the excess. Quickly dip into the sandy sugar and then place on top of the middle of the dipped cookie. Work fast so that the candy melt will glue itself to each cookie. Pop the cookie sheet back into the freezer for 10-15 minutes until completely hardened. Remove from freezer and carefully lean the cookie hats along the side of the cookie sheet. Re-microwave the candy melts in the same 30-second increments until they are smooth again and transfer into a piping bag and cut the tip off. Pipe on 3 dots onto the middle of a hat. Use a toothpick to drag the dots together to connect them and make a shamrock. Pipe a line from the bottom of the dots to create the stem. 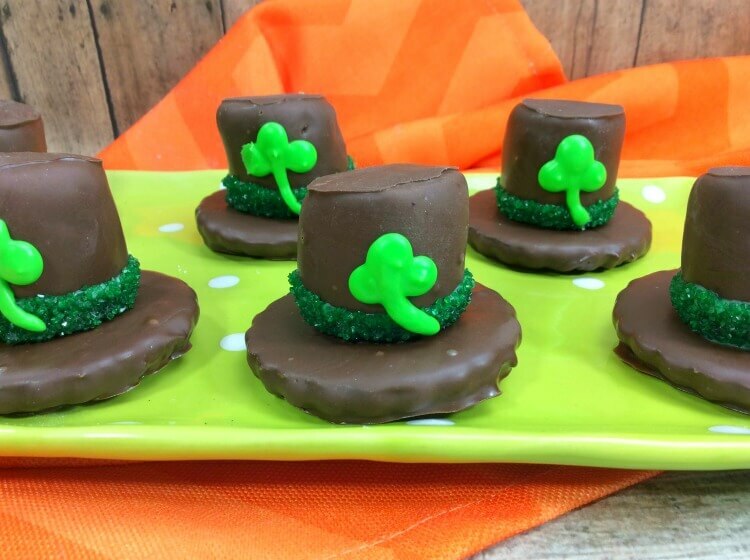 What an adorable St Patty’s treat! Also how have I never heard of this Disney movie?! Now I need to watch it. Glad I got to participate in Lucky Movie Monday with you! Ok, well these are just super cute!! I’ve heard of this movie since childhood and never seen it!! Def need to give it a watch. Pinned!